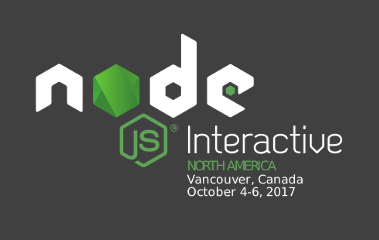 Node Interactive has wrapped up for another year, and the 2017 event was another success. Held in Vancouver, British Columbia, Canada, the event ran from October 4-6, 2017. IBM was Platinum Sponsor for this event, and we are all proud to have been involved. Vancouver’s fantastic scenery and pleasant weather provided a lot of competition to last year’s host city of Austin, Texas. But as amazing as the scenery was, the attendees were there to learn more about Node.js - and there was a lot for them to digest! We don’t have space to give all the keynotes and sessions justice, so we’ll share some highlights below. The Node Foundation’s Marke Hinkle began the event with a welcome and Node.js Update keynote speech. He covered the latest growth and adoption of Node.js, explained how the Node Foundation works, and encouraged people to learn more skills through Nodeschool. Kim Crayton, Community Engineer and Advocate, presented thoughts on improving diversity and inclusivity efforts in her keynote, “You Know What They Say About Good Intentions”. She talked about making this “Wild West” industry go beyond codes of conduct as reactive measures and instead take proactive steps to make communities safe, inclusive and diverse. Michael Dawson’s keynote on developer efficiency and production success was well-attended, providing insight on IBM’s efforts to create tooling and support throughout the entire development life cycle - much of it open source. A keynote panel focused on “The Many Facets of Sustaining an Open Source Ecosystem”, and great perspectives and insight were offered by IBM Developer Evangelist Erin McKean, Microsoft’s Maggie Pint, and Node.js’ Tracy Hinds. Their comments ranged from growth of Node.js, diversity within the Node ecosystem and the relationshops between corporations and Open Source. Speaking of Erin McKean, she spent time at two other sessions (a small group discussion for JS maintainers, and a talk on arrays. In addition, she was part of an IBM-hosted NodeMinds dinner which led to great discussion of the care and feeding of the Node ecosystem. She also spent time at the IBM booth, reporting that IBM had a very strong presence at NI2017 and that the booth was well-trafficked. The booth showed off how a TJ Bot used Node-RED and IBM’s Watson to study Twitter mentions of #NodeInteractive. The bot assessed the sentiment and then displayed it with a specific color on a top-mounted light and an arm movement if it was a positive tweet. Conversations at the booth covered the code used to create the TJ Bot, how to use the open source LoopBack framework, how API Connect can handle Enterprise needs, and the various ways IBM uses Node. Day One at the convention center wrapped up with a BoothCrawl, giving attendees an opportunity to check out the technologies at the booths, get some swag, and enjoy the free drinks that rewarded a long day. Further rewards - and a lot of fun - followed in the Attendee Party, hosted at the nearby Steamworks Brew Pub. This party sprawled onto multiple floors with eager attendees, tasty food and thirst-quenching beverages. When this party wrapped, several folks kept the party going by exploring the Vancouver nightlife - and they still managed to make it to the next day’s early sessions. And with all that work, Thomas Watson reported that the Node.js repo crossed 40,000 stars. During the Collaborator’s Summit, we did some health exercises, working through what we (small breakout teams) believed to be our core values. A tweet from Sarah Novotny demonstrates. Afterwards, we broke into smaller sessions/groups of people to discuss areas of focus, such as security, performance and community. This recap is by no means complete! We’ve just scratched the surface for this amazing event. You can find out more by checking out the event recap photo stream hosted on the Linux Foundation site and the recorded talks! If you didn’t make it this year, it’s never too early to start planning for next time.